Danica Lo / Personal: Free career advice! If you're coming to SXSW this March and have questions you've always wanted to ask someone about working in lifestyle media, digital editorial, food media, fashion writing, or just broader digital strategy, consider signing up for a one-on-one mentorship session with me! 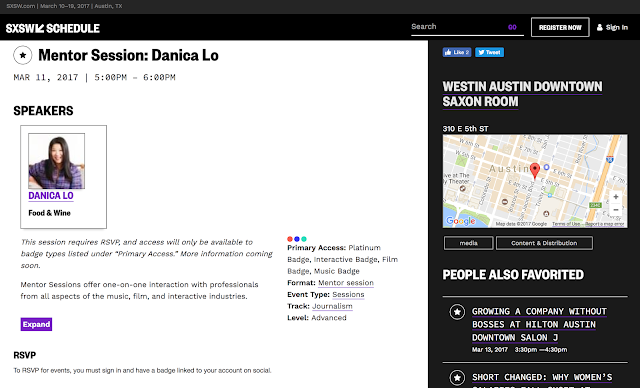 I didn't know the mentorship program existed before I was invited to participate this year, but at SXSW, you can sign up to have one-on-one sit-down sessions with people who work in your industry—or the industry you want to get into—outside of the more impersonal panel-talk setting. I'll have office hours on March 11th, from 5 p.m. to 6 p.m. at the Westin Austin Downtown. You can sign up for a time slot by clicking the image, below.